Chocolate Chip Oatmeal Carmelitas are a simple, rich bar cookie with tons of pecans, chocolate chips, and dollops of dulce de leche piled on a soft oatmeal crust then baked for a delicious treat! 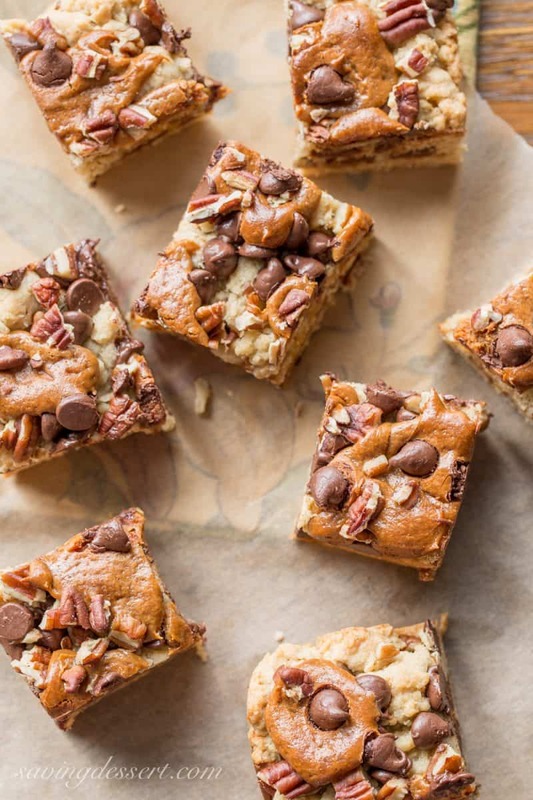 No doubt about it … these bars are a mouth-full of nuts, caramel and chocolate and always a favorite on the dessert table. The oatmeal base is soft, without being crumbly or dry, so you can sink your teeth into the rich caramel. The dulce de leche remains soft but not sticky after being baked so the Oatmeal Carmelitas are not overly gooey. 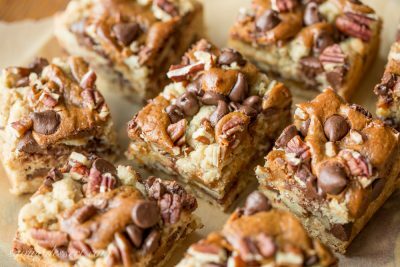 Oatmeal Carmelitas have been around for a long time but didn’t always include chocolate chips in the layers. I haven’t tried making them without chocolate but imagine they’d still be crazy delicious. 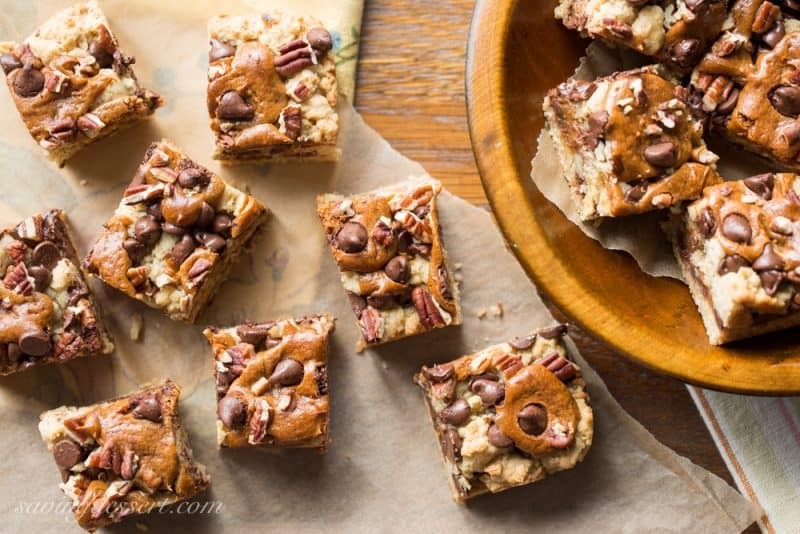 These remind me a little of Peanut Butter Oatmeal Revel Bars which are a personal favorite of mine. Be sure to cut them smaller than you would think as they are very rich. The simple oat base keeps them from being over the top sweet so no worries. I used dulce de leche for the caramel layer because it’s super easy and ready to go when you open the can, and it tends to be a little less sweet than caramels or caramel sauce. If you want to make your own Homemade Dulce de Leche Caramel, check out this post by Melissa’s Southern Style Kitchen – so easy and delicious! Bittersweet chocolate chips would also be a great choice but I think milk chocolate chips would be too sweet. One thing I know for certain, these will disappear in a flash at your next tailgate party or event. 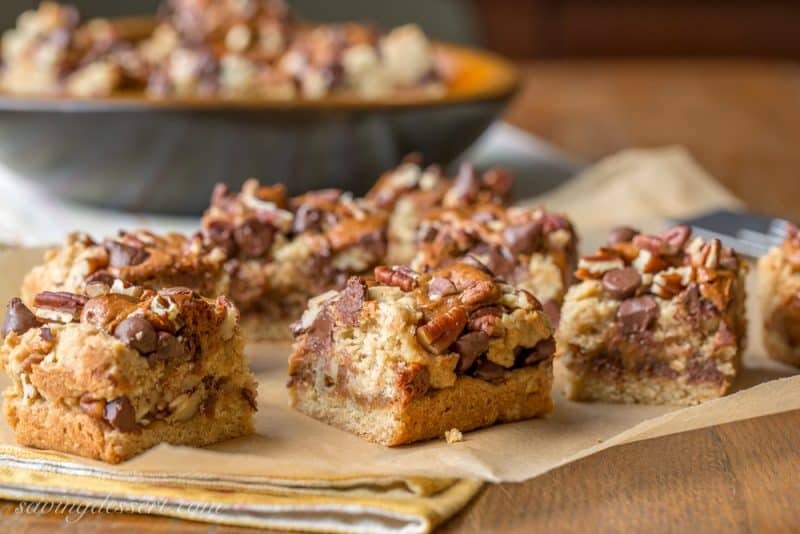 Loaded with pecans, chocolate chips, and dollops of dulce de leche piled on an oatmeal crust, then baked into a delicious treat! This looks delicious! I’m just wondering when you added the egg and vanilla tho? I’m assuming it is with the butter and sugar? So sorry Beth! Thanks for catching that. You are correct and I have updated the recipe. Add the egg and vanilla with the sugars – hope you enjoy and thank you very, very much! Thanks Robyn! Don’t you love this time of year?! Hope you and your family have a wonderful (Canadian) Thanksgiving! 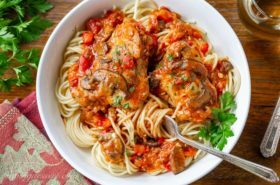 Really great looking recipe! Such a fun bar — oatmeal and chocolate and caramel flavors work so well together. Fun dish — thanks. Thank you so much John – have a great week and thanks for stopping by! MY DREAM FOOD. Looks awesome! They are very tasty Jessie. Thanks for stopping by! Oh my goodness do these look delicious, you always come up with the best combos Tricia, love this!!! 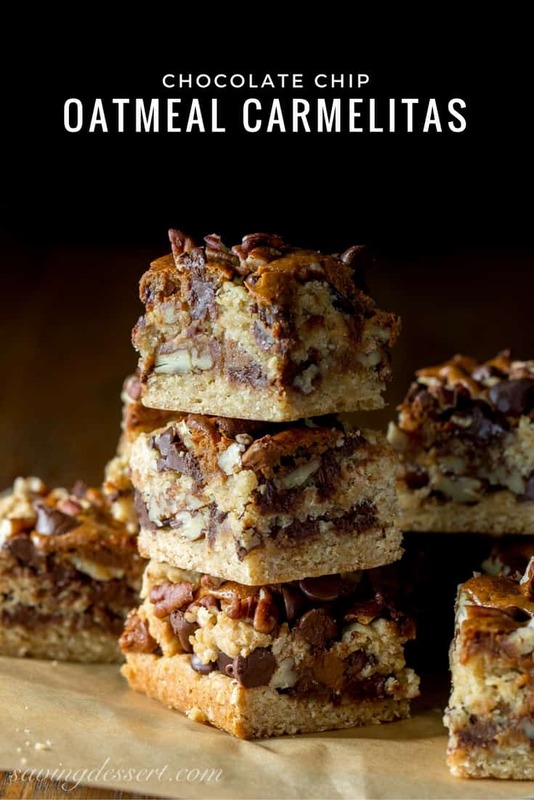 I LOVE cookie bars, in fact, I just joined the baking club at my girls’ school and need to bring baked goods for the book fair, I think I’m going to make this recipe! Sounds like a fun club! I loved this time of year when my children were in school. Such fun! Hope you enjoy the Carmelitas and thanks for stopping by! I love treats you can freeze! 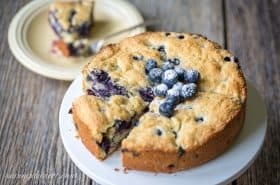 It means I always have something delicious to hand when I need it the most 🙂 Thank you for posting a lovely recipe. Thank you Becky – you have a lovely site! I can’t wait to check out some of your recipes. Thanks for stopping by! You’ve taken one of my favorite bars to a whole new level!!! These look amazing!!! They look luscious, Tricia! 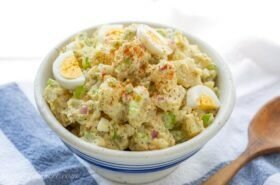 A perfect treat for family gatherings or a football tailgate. I’m sold! What phenomenal photos, Tricia…but I’m sure these are as good as they look! What’s not to love about these! I know they have got to be amazing, and I wish I had some right now. OH I bet we all make these!Merci! 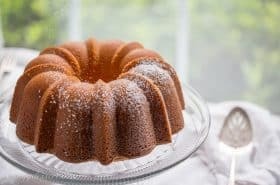 Be sure to make these when you have a crowd to help you eat them Monique! WHERE have these things been all my life? I can’t believe how much you managed to pack into these little bars, Tricia ~ they’d be so dangerous in our house! Wow, amazing photos and a crazy delicious looking bar. Bravo Tricia!! Will definitely try these! Thanks Chris! Good thing these disappear quickly because I don’t need them around the house for long! Yes please! There’s a whole lot of yumminess in these bars, for sure 🙂 Can’t wait to try them. Who could ever resist the combo of chocolates, nuts and dulce de leche? They look divine! Thanks Angie! 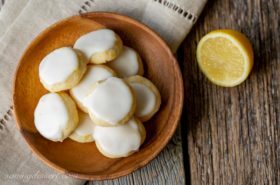 These are a great treat to take to gatherings – always a favorite.